Did you know there’s been a donut pan saga in our home? I’ve been contemplating making baked donuts for the blog since the very beginning, but I always had a hard time justifying a donut pan when my recipes require just standard, minimal equipment. I don’t even own a stand mixer! Yes, I take this minimalist stuff seriously. Fast forward nearly 5 years and practically everyone has a donut pan – except me. I’ve watched as other bloggers put out the most fabulous-looking baked donut recipes, and all the while, I – a longtime donut lover – have sat idly by, thinking they weren’t for me. Enough! I recently realized that it would be worth it if I put it to good use. Besides, what if I created a donut that was not only simple to make, but also undetectably vegan and gluten-free? Clearly, I bought the donut pan and haven’t looked back since. Friends, let’s make DONUTS (finally)! This recipe is simple, requiring basic ingredients and 30 minutes to prepare! And they’re naturally sweetened and (vegan) butter-free! The base is adapted from my 1- Bowl Vegan GF Chocolate Hazelnut Cake (hubba), only in place of the flax egg, I tested out aquafaba! No surprise – it totally worked. However, I also included some workarounds in the notes if you don’t have (or are afraid of) aquafaba. While your donuts bake, why not make an optional (but highly recommended) naturally-sweetened coconut oil glaze? That’s what I said! Doooo it! Doooo it! 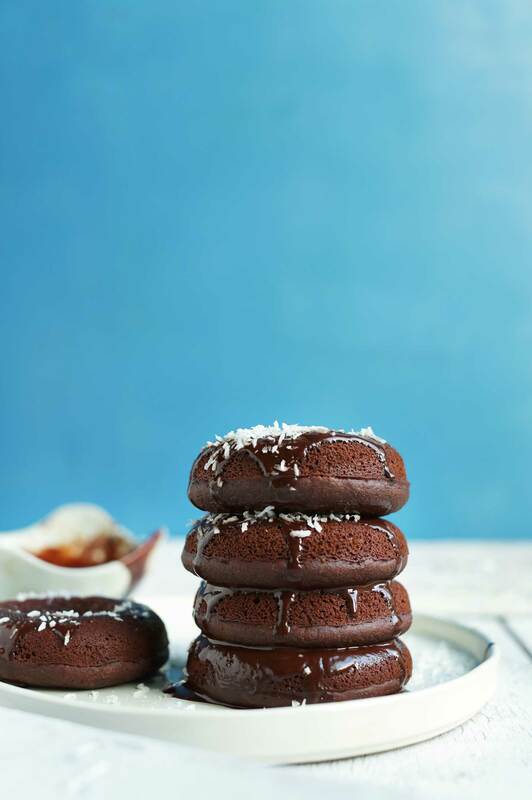 These donuts would make the perfect lazy weekend breakfast treat or healthier dessert! The optional glaze kind of seals the deal, in my opinion. Plus, it allows for fun toppings like cacao nibs, coconut flakes, and sprinkles! If you try this recipe, let us know how it goes by leaving a comment, rating it, and tagging a photo #minimalistbaker on Instagram! I’d love to see what you come up with. Cheers, friends! 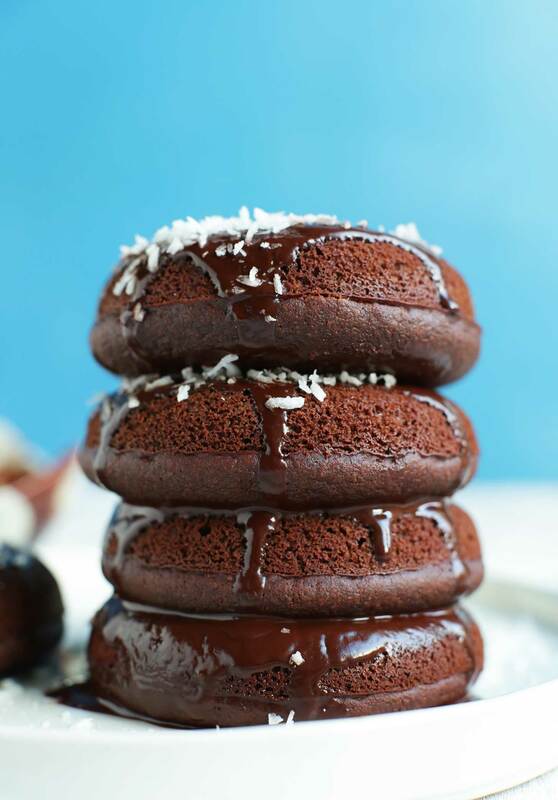 Fluffy, baked chocolate cake donuts made in 30 minutes! Gluten-free, perfectly sweet, and topped with a simple coconut oil glaze! Preheat oven to 375 degrees F (190 C) and lightly grease two donut pans*. Warm almond milk in the microwave. This way, it doesn’t harden the coconut oil. Set aside. To a large mixing bowl, add the melted coconut oil. Then add the coconut sugar, maple syrup, vanilla extract, and sea salt and whisk vigorously to combine - about 45 seconds. Then add applesauce and warmed almond milk and whisk once more to combine. Add baking powder, baking soda, cocoa powder (sifted if clumpy), almond flour, and gluten-free flour and whisk to combine. Lastly, add the whipped aquafaba and gently stir/whisk in, trying to be as gentle as possible. If the batter appears too thin at this point, add 1 Tbsp each almond flour or gluten-free flour at a time until it thickens up. It should be semi-thick and more scoopable than pourable. Divide batter evenly between donut tins, filling all the way full. There should be 11-12 donuts (amount as original recipe is written // adjust if altering batch size). Bake for 18-20 minutes or until a toothpick inserted into the center comes out clean and the top appears dry and fluffy. Time will vary if you sub ingredients. In the meantime, make glaze (optional). 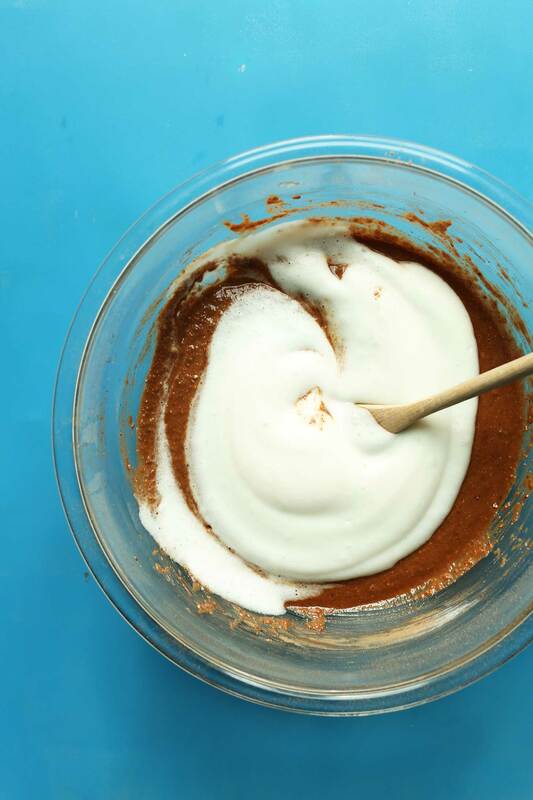 To a small mixing bowl, add melted coconut oil, maple syrup, sifted cocoa powder, salt, and vanilla extract. Whisk to combine. You should have a slightly thick glaze. If too thick, thin with a little maple syrup or more coconut oil. If too thin, add cocoa powder. Taste and adjust sweetness if needed by adding more maple syrup. Set aside. Prepare any other toppings, such as coconut flakes, cacao nibs, or sprinkles, at this time. Remove donuts from oven and let cool for 1-2 minutes. Then grab the tins with a towel and tap on the counter 2 times to loosen. Then gently invert onto a cooling rack. Let cool for 5 minutes (the longer they cool, the more they'll firm up). Dip in glaze. Then top with desired toppings, such as sprinkles, coconut flakes, or cacao nibs! Best when fresh. Store cooled leftovers covered at room temperature up to 3 days or in the freezer up to 1 month (best if stored unglazed). *Aquafaba is the "egg" in this recipe. Alternatively, you can try subbing 1 1/2 flax eggs (or 1 small egg if not vegan // amounts as original recipe is written // adjust if altering batch size). *I've been preferring almond flour over almond meal because it yields a lighter, fluffier (less dense) baked good. But you can try subbing almond meal. Or, if you have a nut allergy, try subbing a 1/2 +1/2 mix of GF flour and oat flour. *If not gluten-free, sub the GF blend for all-purpose flour. I haven't tested it this way and can't guarantee the results. *If you don't have donut pans, you can try baking these in a standard muffin tin! Fill slightly more than 1/2 full and bake for about the same amount of time or until a toothpick in the center comes out clean. *Recipe adapted from my Vegan Gluten-Free Chocolate Cake. *Nutrition information is a rough estimate calculated without the glaze. What can I use instead of the oil? More applesauce? Hi Sandra, we haven’t tried it without oil and aren’t sure how it would work. But applesauce would probably be the best alternative. If you give it a try, we would love to hear how it goes! I cannot have any grain including rice, could I make this with only almond flour and tapioca flour? Thanks! Hi Bethany, we haven’t tried that, but it could work. It may turn out a little more dense. If you give it a try, we would love to hear how it goes! Hi- Could I use Bob’s Redmill 1:1 GF flour instead? I made the vegan version but with regular flour. These are very good, but they don’t taste anything like a cake donut. To me they taste like chocolate cake. Very rich, moist, and an excellent chocolate flavor–also the glaze, which was very thick and I spread it on with a knife. As a chocolate cake type dessert, this is a 5 star and I will use the recipe instead of my cupcake chocolate cake mix. As a cake donut, well…. I can’t really give it a 5, even though it is definitely delicious. My organic cane sugar is thick – should I ground it in my vitamix to make it finer? Not sure what would be better for the fluffiness of the donuts. Do you mean it is clumped up? This should help! I made this using the suggestion of 1 1/3 flour and bake for 15 minutes if we don’t use gluten free and it worked great. I don’t have a donut pan (but now we want one after making these!) so I used a muffin tin and it made 18. My husband loved them too and now he is really serious about eating healthy desserts! Thank you for your inspiration. Great! Thanks for sharing, Brenda! They were a hit. Thanks! Great! Thanks for sharing, Delnora! Donuts came out moist, fluffy & absolutely divine. Will definitely be using this recipe again. I used the King Arthur gluten free flour blend with excellent results. I prefer the flavor of it over the Bob’s Red Mill brand. For Nancy K-maybe the saltiness was from the aquafaba. If your aquafaba came from regular canned chickpeas, it contains a lot of salt. You could cut back or eliminate the added salt in the recipe or use unsalted chickpea liquid. Made these last night and they were delicious!!! My glaze consistency didn’t turn out well. It became thick and sticky. I followed the directions to a T! Added more coconut oil and a splash of hot water but that didn’t help. Any suggestions? I made this. No modifications that I know of. Only 8 were made and the batter was sticky not runny at all so the tips came out rough rather than smooth. Any insight? You are an absolute genius! Can’t wait to try, thanks. If don’t have ingredients to make the gluten free flour blend. What else can I use, for instance can I use quinoa or oat flour? If you’re not gluten-free, sub the GF blend for all-purpose flour. We wouldn’t recommend using just oat or quinoa flour and find that the GF blend works best. If you experiment with it, report back on how it goes! 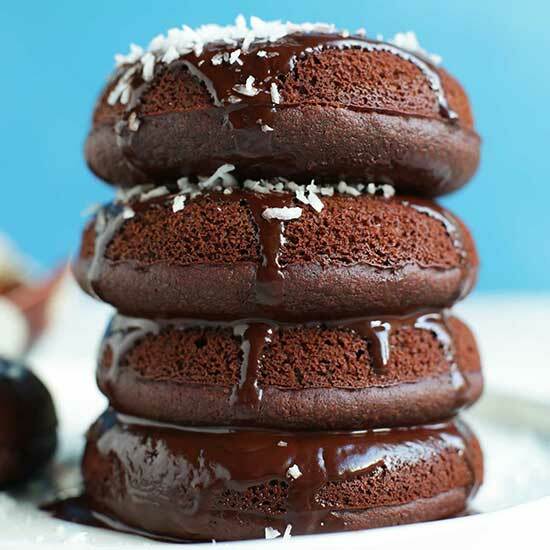 I was wondering if I could make this recipe without the cocoa powder? Hi Shawn! While we haven’t tried and can’t say for sure, we’d love to hear if you experiment with it! Someone suggested replacing the cocoa powder with pulverize dried berries. I am going to try it as chocolate is no good for us. Thanks for the recipe. These are amazing!!! I’ve always been turned off to the idea of baking with aquafaba but I’ve heard so many great things that I decided to try it and was amazed at how delicious these were!! Super simple to make and I gave them to my parents and their friends (none of whom are even slightly vegan/vegetarian) and they all raved about them! Thanks for this recipe, can’t wait to make these again! I used pudding instead of applesauce. Much moister! These were delicious! I hate being one of those people that says “hey I tried this recipe but I made all these changes”…but here I go…We aren’t gluten-free so I followed another commenter’s lead and omitted the almond flour and GF flour, replacing with 1 1/3 c AP flour. Also, I didn’t have any aquafaba, so I did the 1 1/2 flax eggs. I had to use a mini bundt pan because I forgot to buy the donut pan while I was out and they cooked for about 11 minutes. I iced them using that Parkers whipped Maple Butter. My husband, 6yo and 4yo loved them as well! I actually made these FREEFORM! Just added a bit more almond flour to make it a little stiffer, placed ice cream scoop sized blobs on a parchment paper covered pan, then formed into donut shapes with my fingers! Talk about minimalist. They were a HIT! still moist, and adorable! Can I use all purpose flour instead of almond and the gluten free flour? Check the other comments for suggestions! I wouldn’t recommend all purpose as others have reported the donuts coming out dry. I made these this morning and they are perfection! Fluffy and moist and perfectly sweet and delicious, just as you described. I was missing a few ingredients so made the following substitutions that seemed to work very well: subbed one very ripe mashed banana for the applesauce, used a real egg, and used macadamia milk. I also used Bob’s Red Mill 1:1 GF baking flour for the GF flour portion. Cannot thank you enough! Is there a healthier alternative to coconut oil (no saturated fat)? So, I just made these today. My son has an egg allergy and we limit gluten. They are tasty!! 1. I only got 7 of them. Could that be because my donut pans are bigger? They seem to be the standard size. Or is it because of the gluten free flour I use? Pamela’s baking and pancake mix. 2. Mine fell apart a lot. Do I need to use more Aquafaba? I used cane sugar and everything else you listed. I am hosting some friends this weekend and I want to make them these! One question, I am currently abstaining from any processed sugar, what would you recommend I use instead of sugar? Or do you think it’s okay without? Thanks :) Excited to try this! Wanted to ask the same exact question :) would more honey work? We think so! If you give it a try, we would love to hear how it goes! My gluten-free despising husband loved this recipe. Definitely going to be a repeatable recipe. I thought for sure this was not going to turn out when my aquafaba pretty much went flat when whipped into the batter but turned out amazing! I am allergic to coconut and almonds…are there any other ingredients I can use to replace those ingredients in this recipe? I tried this recipe and measured all ingredients carefully by weight and the mix dry and rolled into cookie type balls. I am heart broken and know for sure that I followed the method step by step. Can you please check the ingredients because there is something very wrong in the wet and dry proportions. Yummy. Can I make a batch and freeze it, at a needed occasion de freeze and put into the oven?, fluffy will still remain? Hi! While they are best fresh, you can store cooled leftovers in the freezer up to 1 month (best if stored unglazed). I would just thaw them at room temperature before serving! Hi! Not sure that would work, we recommend baking them first and then freezing them! If you do decide to try it, let us know how it turns out! Very chocolatey. I didn’t read through carefully so a few ingredients surprised me while baking on the fly. I used blueberry puree and gluten free/paleo pancake mix as my gluten-free flour. I’ve never used Aquafaba and it is fabulous. I like my donuts a bit more moist, so I baked them a bit less and would even bake them a minute less than that. In the frosting, I added about a teaspoon of organi creamy peanut butter for flavor and texture. My “cake” cravings are totally satisfied, so again Thank you! Is there a way to replace the brine from can of chickpeas? I’d prefer to not use anything canned. Would it be possible to soak my own chickpeas in a can and use that liquid? Hi! Yes you can! This should help. Yum! I made these but I poured the batter into mini cupcake tins and put a frozen cherry in the middle of each cupcake before throwing them into the oven. They came out like fudgy cherry brownies! Loved these and would love to see more donut recipes on the blog! Great recipe! My non-vegan husband, kids, and friends all loved it. The texture is more like a cake but delicious nonetheless. I put the leftover in the fridge and the next day it tasted like brownie. Delicious! I had Aquafaba in the freezer to make Vegan Mayo . I saw this recipe and ran out to get a doughnut Pan to try. Oh my these are amazing! Hard to believe they are gluten and egg free! I’m sorry to be negative but I made this recipe exactly to your specifications and it’s fairly gross. The consistency is nothing of real donuts and it has a very strange taste. I made the glaze, but it was very thick. I tried microwaving it to melt the coco oil more (which was already liquid) and i think i made it more thick! oops. Any suggestions to make it more liquid like? It was more like a chocolate paste, rather than a liquid glaze. I made a few substitutions to avoid going to the store. I used mashed banana instead of applesauce. I used 3/4 cup bread flour and 1 cup whole wheat pastry flour. I ended up having to thin the recipe out with almond milk after that, so if I did it this way again I’d add the flour in slow increments while mixing instead of adding it all in one go. I also used agave instead of maple syrup in both the donut and the glaze. They turned out AMAZING!!!! I was nervous because of my changes, but theyre SO good! I’m sooooo excited to try this recipe! I’ve hoped you would create a gluten free and vegan donut for so long! Made this and they are awesome! Used a flax egg rather than aquafaba. I used regular wheat flour rather than almond/gluten free. I followed the advice of another baker and used 1 1/3 c of regular flour. I found that I could cut baking time to about 13-15 minutes with these tweaks. Made the glaze and that was pretty simple, and I decorated with coconut flakes, decorating sugar, and decorating pearls (not all on the same donut, although that would be pretty delicious too). If you decide to use decorating sugar, don’t be impatient like me. Wait until the donut cools otherwise some of your sugars will melt on the icing. (Still tastes good..hahaha). This recipe is great. I made this for my daughter who is allergic to and intolerant of dairy. It was her first donut and they were so delicious. I added a little bit of water in the end to thin out the batter and it worked great! The donuts had a lot of depth in flavor and the texture was just crumbly when you bite into them or break them apart. The aquafaba is a great ingredient that really brought the batter together. I may use a raspberry glaze on top next time I make these. I’d also love to see other donut recipes from her! If using an egg, would you just whip the whites and fold in or just mix in the egg? So good! I subbed AP flour for the GF, but kept the almond flour. Flax/Chia egg instead of aquafaba, so probably less airy but not dense at all. Best baked donut recipe I’ve come across yet! I used a bag to pipe it into the pan and that seems a lot easier than trying to spoon (my batter was very thick). Made these last week and they were AMAZING. First time using aquafaba and it worked like a charm. Thanks to the comments I knew to use 1 and 1/3 cup of all-purpose flour as an alternative to the gluten-free flours. Only problem was the batter didn’t quite make 12 donuts – will have to ration better next time. Just taste tested! Delicious, and surprisingly eggy and springy texture. I did have some trouble part way through, I noticed the batter was way too thick (couldn’t even stir it), and added about another 1/2 cup of milk. Could be the difference between different gf flour blends? I was using President’s choice gluten free all purpose flour blend, and I did use almond meal as well. I have some experience baking with aquafaba already, so did not find it difficult to use. Can I sub the gluten free flour with regular flour? Or will it ruin the consistency? Hi! Others tried substituting with all-purpose flour. Check the other comments for tips! Good luck! Hi Dana, I love these donuts. I made them this morning and they are delicious. I wanted to ask if you have an oil you recommend other than coconut for my daughter who doesn’t care for the flavor? Dana, as many (and yourself) already know: You’re a goddess. 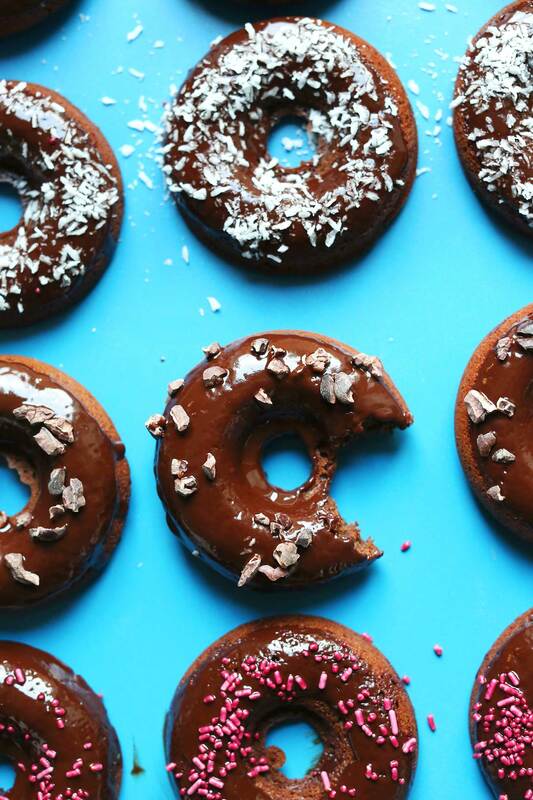 And these donuts just illuminate your creative foodie goddessness. I was soooooo in love with the batter (absolutely fluffy and airy; divine), and from one taste of a lick from the spoon I knew they were gonna turn out good. I just didn’t realize HOW good! They are amazing!! Insanely delicious donuts. I am SOOO in love! Hi Dana! These turned out amazing!! I was wondering what your thoughts are about using vegetable oil (safflower, canola, sunflower) instead of coconut oil. Some people can’t tolerate the saturated fats for health reasons. Thanks! These look amazing, but there used to be a recipe on this blog for blueberry lemon chia seed donuts, does anyone know where it went? You’ve done it again! You’ve inspired me. I’ve been debating on whether I should buy a donut pan or not, but I think this post helped me make my decision. Can’t wait to get it and try the recipe! I need to incorporate more chickpeas in my life – however, they are SUPER addicting… Much like I think these donuts would be! I mostly use Oat flour and it works great almost everytime! I am going to bake these beauties with it. I guess it will be amazing! I just made these today and ….well they are gone ! They were amazing ! Whole family loved them ! Just finished making this and I’ve already eaten three! SO GOOD and I feel like a baking wizard! Thank you for this awesome recipe. Oh, and I used Follow Your Heart’s Vegan Egg replacer. Worked like a charm. I have become addicted to your blog. It is definitely one of my favorite things. I recently discovered my own increasing food sensitivities. Your adaptability and substitutions have been such a good resource, both good recipes themselves but also good ideas for altering other recipes. Thank you for your attention to details and your creativity. Also, your photos are fantastic. These were delicious! When making these I ommited the almond flour and just used more of the regular gluten free flour because my younger brother is sensitive to nuts. My batter also ended up really thick which may have been from loose measurements so I also added a little water. Rather than a donut pan I used a mini donut maker because it was given to me several years ago and this recipe finally gave me the motivation to use it. I made the glaze but actually like the donuts better without it because it had such a heavy cocoa flavor. My family also tried tossing it in powdered sugar which was also really tasty. Loved the recipe! Made the donuts today and they came out great, hard to get into the silicone donut molds however . They did have a great taste. Not fond of the glaze – thick and too much coco maybe it needed more sweetener for our taste. SO DELICIOUS!!!! I cannot how well these turned out! They’re super moist, they have an amazing flavor…you’re a GENIUS!!! THANK YOU! Also, I used a mini bundt pan and they’re adorable. I should’ve said I can’t BELIEVE how well these turned out. I need a donut pan in my life! We are new to the plant based lifestyle and your blog is my savior! Pasta, soups, tacos, nachos, cakes…we have absolutely loved every single one of your recipes that we have tried. Thank you! These look scrumptious! We are oil-free for health reasons. Could I substitute unsweetened applesauce for the oil in the donut? Hi! While I haven’t tried it, give it a go and report back with your results! Good luck! Wow love ur blog ! Looks amazing ! I am baker from India & I too make eggless cakes for my clients I offer them low cal options too . World is changing towards healthy options . This was my first time using my donut pan and I “donut” think I can top this recipe! Seriously delicious and so quick to whip up! I used a mini donut pan and they were done in about 10 minutes. Thank you so much! Yuuuum! Julie from Australia here, I totally get the Donut pan dilemma and yes for me that is about to change also. I make old school donuts but have been asked multiple times to please make vegan donuts. After much searching for the right recipe you post yours so here goes…. Will let you know how they go. Those donuts look FAB! I would like to make them and send them back to my friend in New York. I am in Portland, Oregon. How is the shelf life? If I froze them first and sent them priority, do you think they would still be good? Those donuts look tasty, I would do without the coconut. Chocolate and sprinkles for me. I made these today and they are a hit! I subbed regular AP flour for the GF blend but followed the rest of the recipe exactly as written, and they came out great! I baked the first pan for 18 minutes and found that they could have gone for a little less time (they’re still delicious just slightly overdone), so I baked the second pan for 15 minutes and they came out perfectly. Did you still use the almond flour when sub the gf flour? I made these and they were great! The only thing I changed was the glaze – I melted some camino bittersweet chocolate and dipped them in that. These were a hit with some random non-vegans too. Anyone else had luck with flax eggs vs. aquafaba? I used the flax egg instead and they turned out great. 1 cut the recipe in half but used 1 Tbsp ground flax mixed with 1/4 cup water though. Delicious! My husband made these for me and we thought they were great! Love your recipes. So step four where you combine the coconut oil, etc got too clumpy. Also I didn’t have gluten free flour and for some reason the donuts tasted salty…. Would that be why!??! I’m going to try again cuz I love Minimalist Baker! Hi Nancy! If your coconut oil got clumpy, try slightly heating your almond milk before adding next time. This usually doesn’t happen, but if the other wet ingredients are too cold it can cause the coconut oil to seize up. Not sure why why’re salty! Maybe nix the salt next time and check your flour blend. Good luck! Oooooh, thank you so much for this. I’ve been wanting to crack the vegan donut game for a while. Is it okay to store the mix in the fridge for a while? Also, on a different note – are you thinking about doing more recipes with lentils? Because I would totally been down for that! I’m into doughnuts now, too! I can’t believe that I made room for the pans in our tiny galley kitchen, but it’s definitely worth it…a new flavor every week, starting with chocolate of course. I am definitely using your glaze for more than just doughnuts, can’t wait to try it on Valentine’s cookies. Can we use raw cacao powder instead of cocoa powder? Hi! Yep that should work just fine! So I made this. Sadly I did not have a donut pan so I used a muffin tin resulting in them not being properly baked. I would recommend really getting a donut pan for this one. The donut itself was one of the most delicious things I’ve tasted in my life. Oh my gosh, I just took them out of the oven and they look and smell amazing. I just wanted you to know that if you substitute with all spelt flour the donuts are ready in 12 minutes as opposed to 18. Also, I used the Aquafina from chickpeas I cooked earlier today and it became frothy. I will post a five on appearance alone. That said, none of your recipes have ever tasted less than amazing. Thanks for sharing. These look AMAZING! I have to try asap! Just use refined coconut oil and it won’t taste like coconut! Hi! Other’s in the comments used refined coconut oil and didn’t taste the coconut flavor. Maybe give that a try? Otherwise, canola oil may work? I have not tried it but if you do, let me know how it goes! I used walnut oil, actually, and it was fine. I sometimes us Sun-Coco oil for baking, too. Just so you know I think subs and tweaks work pretty well: I also halved the oil, halved the sugar (and used Big Tree Farms vanilla coconut sugar), halved the maple syrup, upped the applesauce and aquafaba each a bit, reduced the almond flour to half a cup, and used a blend of oat and quinoa flour, and raw cacao powder, oh and added a scoop of chocolate protein powder…and it was still EPIC. Sweet, fluffy and insanely good. Can’t keep my hands off them. :) Thanks! Looks terrific! Can I make it with only the maple syrup? Thanks! Hi! Are you thinking in place of the glaze? It may work but would bring a whole different flavor to the donuts! If you give it a try, let me know how it tastes! So I make my own chickpeas and do not use cans. What can I use instead of the aquafaba? Or could I use the liquid from the chickpeas once they are done cooking. A lot of your new recipes call for aquafaba so I would like to find a way to make them. Hi! You can use the liquid left over from cooking the chickpeas! Sorry, I meant to say Aquafaba! I was wondering if I could use cacao powder in place of cocoa powder or would it yield a different taste? You could probably substitute cacao powder successfully (but maybe with a less intense/chocolatey taste) but the health benefits of cacao diminish when heated or cooked. I’d save the pricey cacao for raw recipes and get some cocoa powder. Actually cacao will give it a MORE intense taste not less intense. :) Since I drink hot cacao vs hot cocoa and believe I am still getting many of the benefits, I use it for baking also. it was amazing in this recipe! So Dana, you don’t have a mixer but you do have a donut pan? Surprised—-but happy you posted this because it sounds good. I live in the South where fried nonvegan junk is featured in donut places—-but I may be up for this! Does Aquafaba contain phytic acid? We soak and rinse legumes and nuts to get rid of the phytic acid ostensibly because it hinders absorption and digestion of nutrients… so, is using this phytic acid juice okay… a all? once in a while? What do you think? I personally can’t see how the phytic acid could be harmful enough that we’d have to worry about it when the entire world consumes foods containing it on a daily basis. That said, phytic acid is inert after it’s cooked, as cans of chickpeas [and most other things we’d consume which contain it] are. Thank you Panya! I am eating a plant based diet due to chronic illness, I try to help my digestion as much as possible by taking enzymes and using probiotic foods. I guess I just worry it might be a bit of extra work on my system in particular because of my pre-existing digestive woes, which is why I make sure to sprout all my legumes and nuts. :-) I can probably handle aquafaba once in a while. Aquafaba is not phytic acid. It’s essentially a salty base that the already cooked beans are in to preserve them in the can. Think of all the bagel possibilities too! I just made these and they were perfect! I’m not gluten free so I didn’t use almond flour or gluten free flour, instead I used 1+1/3 cup all purpose flour. Also I baked mine in a cupcake pan, it yielded 16 and they were done in 15 minutes. Thanks! And thank you for being such a vegan genius. You making being vegan so fun and every time I make one of your dishes for a dinner party it’s always the crowd favorite. Thank you thank you thank you! Thanks Nora! So kind. Glad you enjoyed these + thanks for sharing your modifications! I’m not gluten free and so I made them with all purpose flour and they were so dry that I had to add more almond milk to the batter before baking even… and they were still dry and crumbly. I think if using all purpose, go with less flour than called for. I also personally think they need a tad more sweetener. My daughter didn’t even finish hers. I baked them for 15 mins, but probably should have done even less. Was a bit disappointed since I was so looking forward to these! ? For the almond flour and GF flour blend, do you reckon Millet flour and Buckwheat flour would work? That’s what I have at home atm. Hi Rita! Not sure. But if you give it a try let me know how it goes! I recently started following a gluten-free vegan diet and I can’t get enough of your blog! Can I use turbinado cane sugar for this recipe? Hi! Turbinado can sugar should work! Will honey work to replace the sugar? I have a lot of food sensitivities and honey is the only sweetener I can have (no sugars, syrups, etc.). Hi! If you aren’t vegan, honey will work just fine! Happy baking! These look so good- my kids will flip! I know this is crazy but I don’t like chocolate at all (I know I’m weird). Anyway to omit the cocoa or is that a whole other recipe?! That’s probably another recipe! Stay tuned. I’m not sure but if you give it a try let me know! Also, coconut flour is very absorbent so only use a small amount (generally 1/4 of what is called for). Can I sub almond flour? Hi! Try subbing a 1/2 +1/2 mix of GF flour and oat flour. Have you ever tried carob instead? We don’t eat chocolate and I subbed carob powder (slightly less) and we loved them :) Would be great with a peanut butter glaze! Yes, a standing mixer should work! We don’t have a recipe for old fashioned donuts yet, but I’ll add it to our recipe request list! What! I need a donut pan in my life! 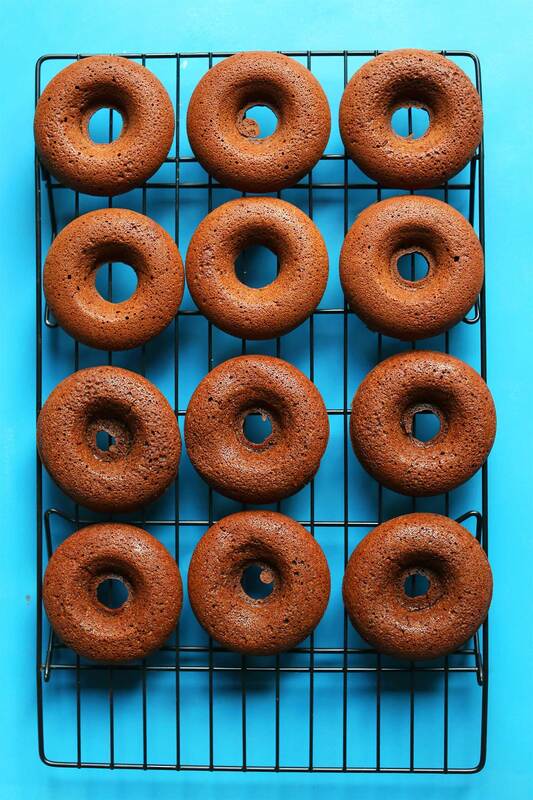 My kids would go wild with delight if I was able to cook delicious gluten free, dairy free donuts. I do hope they sell the same on the french amazon website. Promise, the first recipe I’ll try will be these, they look just so delicious. Love! I’m really not a baker, but this recipe makes me want to try baking these! Thanks for this. Lisa, we are not GF but have nut allergies so I want to sub regular flour. How much did you use?